Wikipediais an online encyclopedia that can be edited by anyone. It was formally launched on 15 January 2001. Initially it was created as a complement and ‘feeder’ to the expert-written English-language encyclopedia project ‘Nupedia‘, in order to provide an additional source of draft articles and ideas. It quickly overtook Nupedia, growing to become a large global project, and originating a wide range of additional reference projects. As of 2008, Wikipedia includes several million freely-usable articles and pages in hundreds of languages worldwide, and content from millions of contributors. It is one of the world’s most popular web sites and is an extensively used reference source worldwide. This publishing process is known as “crowdsourcing,” a term coined by James Surowiecki in The Wisdom of Crowds. Crowdsourcing has been used to create textbooks and to solve problems in science and business.
. . . here Trench presented an idea, an idea that – to those ranks of conservative and frock-coated men who sat silently in the library on that dark and foggy evening – was potentially dangerous and revolutionary. But it was the idea that made the whole enterprise possible. The undertaking of the scheme, he said, was beyond the ability of any one man To peruse all of English literature – and to comb the London and New York newspapers and the most literate of the magazines and journals – must be instead “the combined action of many.” It would be necessary to recruit a team – moreover, a huge one – probably hundreds and hundreds of unpaid amateurs, all of them working as volunteers. The project commenced about a year after Trench’s speech. The dictionary would draw from three periods of English literature: 1250-1526, 1527-1674 and 1675 to the present day. A circular was issued asking for volunteers and each volunteer would specify what period they would read from. They would create word lists as they read and also search for words of particular interst to the dictionary editorial team; then they would provide the context for the occurrence of these words. Volunteers would record their findings on slips of paper. Each slip would contain the target word, the date, the title of the book or paper in which it was found, the volume and page number, and finally the full sentence in which it occurred. Volunteers would then submit these to the dictionary’s staff, which sorted them using alphabetically organized oakboard pigeonholes (54 in all). The senior editor would then sort through these slips to find those of the greatest interest and necessity for the compilation of the dictionary. The project moved forward with fits and starts. It’s original editor, Frederick Furnivall, eventually handed off the task of managing the compilation to James Murray, who was better able to motivate the volunteers and obtain sponsorship from Oxford University’s press. The first complete version of the Oxford English Dictionary (OED) was published in 1928. The compilation, editing and publishing of the dictionary took over 70. The scope of the achievement is best characterized by the number of words it defines (over 500,000), the detail of its entries and the sheer physical heft of its printed volumes. The OED team were the early pioneers of crowdsourcing. Their version of the “wiki” was done without the Internet and computer technology. It was also less democratic – while it used volunteers, the fate of the material they submitted was subject to the scrutiny and control of the dictionary’s editorial staff. In this sense, they were a not fully evolved “proto-wiki.” But the project demonstrated the wisdom of crowds and provided an important historical precedent for using amateurs to create important, large reference works. Wikipedia, with over 2.2 million articles and 961 million words, has vastly exceeded the Oxford English Dictionary in its scale and the speed of its growth. 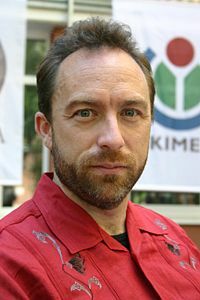 However, Jimmy Wales, the charismatic founder of Wikipedia, would no doubt offer a tip of the cap to the tireless, passionate staff and volunteers of the original OED who for their accomplishment in creating an enduring and monumental reference work. This entry was posted in author tools, blog to book, book marketing, open publishing and tagged crowdsource, dictionary, Oxford English Dictionary, Wikipedia. Bookmark the permalink.